Our grade level is responsible for putting together a Picnic Themed Basket for the silent auction at this year’s Spring Fling. Please send in the items you would like to donate by March 8th, 2019. The Art Show will be taking place in collaboration with STEAM Night, Feb. 12th.The event will take place from 5:30-7:30. If you CAN NOT attend that evening, but would like to purchase the framed artwork, please see the link below to place your request. There will be NO after show sales. If you wish to purchase the framed artwork, you will need to attend the show OR place your request via the link below. ***Purchase is not required to receive the artwork. The purchase is for the matte & frame. All purchases support the art classroom. All unpurchased artworks will be returned to the student later on in the school year. Please keep in kind, there will be NO after show sales. If you can’t make it to the show for ANY reason at all, please submit your request for the artwork below. If you plan on attending STEAM Night/ the art show, there is NO need to submit this request. Spring Fling is Right Around the Corner!! Glow Valentine Sales started today! Mornings from 7:20-7:50am…sales will end on February 8th with delivery on the 14th! February 6th–Spring Fling Planning Meeting 6pm. Come on up to school and help with the Spring Fling! A bit late! December is almost over! Wow! Time flies! Next week (December 17-21) is the last week of this calendar year! Hard to believe! There will be EARLY RELEASE on Thursday and Friday (December 20, 21) at 12:30pm. There will be ASP those two days as well. Check with your classroom teacher to see when Winter Celebrations will be in the classrooms. Wednesday is the House Party for Max from 1:15-2:00pm. There will NOT be snow cone day on Wednesday. Look for information coming on the dates of the last two days. There will be a Holiday Sing Along for first grade on Thursday, 12/21, from 9:15-10:00. January 7th will the first day back from Winter Break! See you all then! Rest up and stay warm! The race is on! Please send in the following items and deposit in the box that has your HOUSE name on it! The HOUSE with the most items donated will win 200 tickets towards the next HOUSE party. 2nd place will get 100 tickets, 3rd place will get 50 tickets and 4th place will get 25 tickets. Let’s fill those boxes!! Turn in all items by Friday December 7th. Items will be donated to the MUST Ministries pantry at McClesky Middle School. Thanks for your support! Come out on Thursday November 15 to the cafeteria and play Turkey Bingo! Doors open at 6pm. Each card is valid for all 12 rounds, $5 per card at the door. Pre-order 5 cards for $20. PTA will be selling pizza. Funds support our STEM lab! 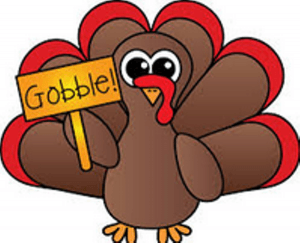 Nov 13 — Thanksgiving Feast during Lunch, Pre-pay in lobby $3.75 each, please NO OUTSIDE FOOD!! We are so lucky to live in a community that has ongoing dedication to reinforcing the concepts of kindness, acceptance, and tolerance. To help us celebrate our No Place For Hate designation, please note the following themed days. Oct 29, Monday: No Place for Hate Kick off Day–We will hand out ‘No Place For Hate’ stickers. Fifth graders will get cool pins. Today is the day students sign NPFH promise. Wear No Place for Hate colors of black and yellow or a No Place for Hate shirt to show our commitment to being a safe place to learn. Oct 30, Tuesday: We’re All Different, We’re all the Same Day–In our diverse world we all have things that make us unique and things that we have in common. We will focus on how we are all part of different houses (Spike, Max, Blackwell and Bulldog), but we are all part of the Blackwell Elementary family. Wear your “house” colors or a Blackwell shirt. Oct 31, Wednesday: Hello Day–We will focus on the importance of acknowledging others in our community with a greeting and a smile. All students will be given nametags to wear so that we can all greet one another by name throughout the day. Nov 1, Thursday: Kindness Counts Day–Kindness is a huge part of our message to students every day and on this day classes will be doing random acts of kindness and reading books about kindness to emphasize the importance of respect and tolerance in our community. Wear a shirt with a positive message today. If you don’t have one, you can make a sticker or sign with a message reflecting kindness and acceptance. Dress like a Rock Star to show that Upstanders Rock!! Fall is here! Hopefully that means some cooler weather is coming soon! We hope you all had a great Fall Break and are ready to rock and roll our way through October! October 15th – 19th: Early Release 12:20pm every day. ASP will still be available. Parent-Teacher Conferences each day. Look for more information to come home. October 23rd: Ben Franklin comes to Blackwell to talk to the first graders! October 29th – November 2nd: No Place For Hate Week Look for more information to come home.